Indonesia's news magazine Tempo is one of Indonesia's most respected publications, but, over its 30 year history, it has never been a stranger to controversy. First launched by writer Goenawan Mohamad and a group of friends in 1971, the weekly was modelled closely on America's Time magazine. With its groundbreaking reporting and strongly independent editorial stance, it soon became the country's leading news magazine. 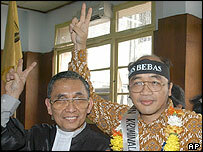 The publication had its first run-in with the authorities 10 years later, during the rule of former President Suharto. It was taken off the news-stands for two months after it published an article on a riot that occurred during an election campaign for Suharto's Golkar Party. An article criticizing the government's decision to purchase 39 former East German naval warships proved to be the last straw, and the magazine was closed down in 1994. The military was reportedly outraged because it was not consulted over the purchase. Some suspected corruption due to the poor state of several of the ships. The banning of Tempo and two other independent publications - 'Detik' and 'Editor' - at the same time sparked street protests and led to the formation of an independent association of journalists, called the Alliance of Independent Journalists. 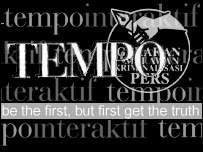 A few months after the ban was imposed, the magazine launched a daily online service - Tempo Interaktif. But full publication only resumed in May 1998, after the fall of Suharto. Since then it has gone from strength to strength. In 2000, an English edition of the magazine was launched, and the following year saw the launch of a daily paper, Koran Tempo. Greater media freedom has been viewed as one of the most promising aspects of the post-Suharto era. The 1999 Press Law was enacted to prevent the state from banning publications, whilst at the same time allowing for the establishment of a Press Council to mediate disputes between the media and the public. But the latest case involving Tempo staff has been viewed by human rights groups and press freedom campaigners as a backwards step. Rather than use the Press Law, prominent businessman Tomy Winata brought a criminal defamation case against Tempo chief editor, Bambang Harymurti. The director of the International Press Institute Johann P. Fritz has criticized the criminal charges. "The use of criminal laws to punish journalists for their writing goes against international law in the area of free expression," he said in a statement. "Indonesia has a thriving media and I am disappointed that, at a time when other countries are encouraging the free flow of information, journalists are being criminally prosecuted for practising their profession."